We require a £50 non refundable deposit to secure all breaks and full payment is due 6 weeks before the commencement of your holiday. The £50 deposit secures the booking and is then held as security deposit against any damage or loss of keys. £50 will be refunded within 7 days once caravan has been checked and no damage occurred. We have never kept a deposit yet! We offer all year round fantastic value for money and have lots of added extras including 2 patio sets and outside storage to make it a relaxing break for you! We offer lots of special offers all year round and are 'OFF PEAK' prices are fantastic value for money! Our Brand New 2016 Platinum Grade Holiday Home is situated on the well sort after area of Waterways within a 2 minute walk to Hoptons sandy beach on a rather large plot perfect for alfresco dining and those relaxing afternoons and evenings and a 4 minute walk to the main facilities. With central heating throughout and its beautiful luxury soft furnishings and veranda it has everything you need for that luxurious break.. The stunning open plan living area comprises of 2 comfortable sofas, a beautiful feature wall with electric fire , Blue tooth system and extra seating uniquely stored under a coffee table. With double patio doors which open onto the veranda. The modern, high spec kitchen has a is well equipped with full size fridge freezer, cooker , extractor fan and lots of high tech new appliances. Absolutely everything utensil you need is in the kitchen, complete with whisk, Iron and sandwich toaster! The dining area consists of dining table and up to 6 chairs. The bathroom is open plan and spacious with high spec fixtures and fittings and a modern power shower, toilet and basin. 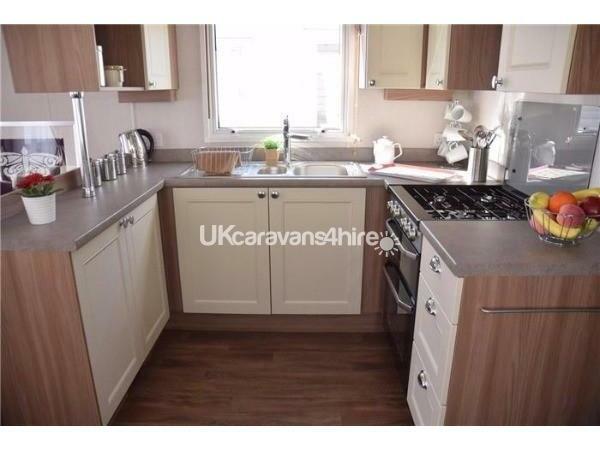 With built in Extractor Fan, shaving plug socket.and light all for your convenience. The 2 twin bedrooms both contain ample cupboard space and built in wardrobes complete with a TV/Dvd player in each room. 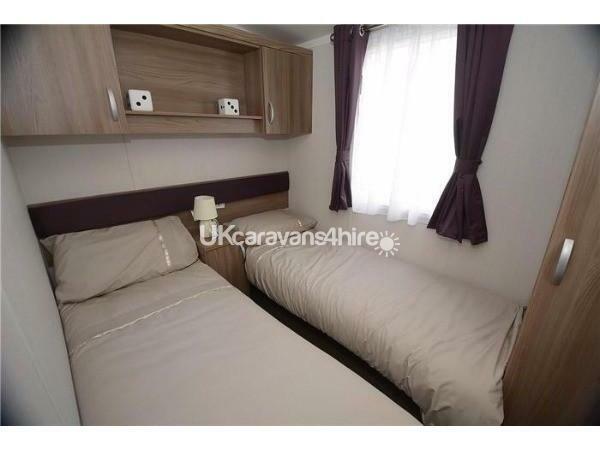 The main bedroom consists of a large dressing area including dressing table and stall and wardrobes. With spot lights over the bed and TV with built in Dvd player. There is also large en suite bathroom comprising of toilet and basin. There is ample space in the main bedroom for a travel cot and to put all your luggage and belongings away . We have a Bluetooth speaker system built into the ceiling of the caravan and also a blue tooth digital radio . 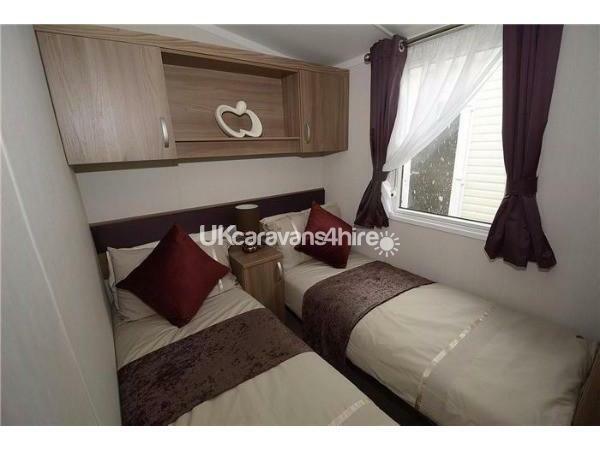 The caravan with its open plan layout and spacious room sizes, situated on a prime location with its out door seating area caters for all your holiday needs. We personally ensure the Caravan in maintained to a very high clean standard and are more than happy to help with any additional requests. Please note we can not do Saturday change overs and do no accept pets. Lead guest most be over 21 years old. Review:	"Wanted to say a massive thank you. We had a great week at the caravan, the park is amazing and suited all out children age range from 18 months to 14 years old. The Caravan was lovely, clean, tidy and had everything we needed for our week away. The park it's self was one of the best ones we have stayed at. The facilities and entertainment was second to none. The staff were friendly and so helpful. We will definitely be going back and would recommend it to anyone who is looking for a hassle free break.A huge thank you Lindsay & Dav"
The nicest, cleanest caravan. The nicest, most friendly owner with very good customer service. She kept in touch with us before and after our holiday. 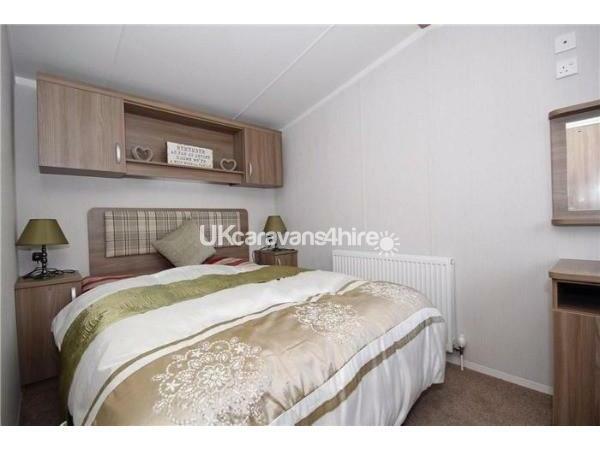 The caravan is is a very good position on a nice site with lovely neighbours. We would highly recommend this holiday. Thank you. 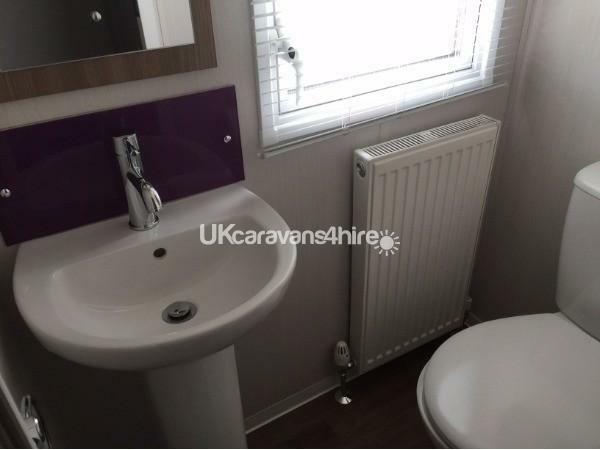 Absolutely gorgeous caravan on a beautiful quiet location.The caravan was the cleanest we've ever stayed in and the park and facilities are of a very high standard. We've already rebooked. Lindsay really did go out of her way to make our stay as perfect as she could. Had an enjoyable weekend, caravan was very clean with excellent facilities. We were there with our son and grandson aged 3 and found the facilities very child friendly. Wouldn't hesitate to make a return visit. Thank you.